The Activity Centre Design Guidelines are now superseded by the Urban Design Guidelines for Victoria. The Urban Design Guidelines for Victoria are now the relevant urban design policy guidelines within the State Planning Policy Framework of the Victoria Planning Provisions. The Victoria Planning Provisions were amended to require consideration of the Urban Design Guidelines for Victoria, where applicable, in the design and assessment of new development proposals. Guidelines for Higher Density Residential Development (Department of Sustainability and Environment 2004). 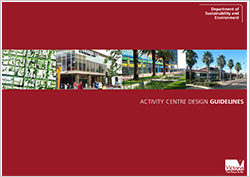 Activity Centre Design Guidelines (Department of Sustainability and Environment 2005). Safer Design Guidelines for Victoria (Department of Sustainability and Environment 2005). Interim Guidelines for Large Format Retail premises (Department of Planning and Community Development 2007).